In 1869 the planned Detroit, Hillsdale and Indiana Railway right-of-way passed over two pieces of vacant land on the western edge of Somerset Township. One piece belonged to Jerome Smith and the other to Mary Begel. Filled with ambition as a result of the importance of railroads at that time, the two planned the village of Jerome so that it straddled their properties and the right-of-way. Then the railroad established its Jerome station before the plat for the village was even filed. The Carpenter Hotel in Jerome. From the left are Lester, Catherine, Mildred and Geraldine Carpenter and Hilda Haltom. The man at the far right is Ira Wertenberger, who lived at the hotel for three years while he was the teaching Superintendent of the Jerome Public Schools. The Jerome High School later consolidated with North Adams. 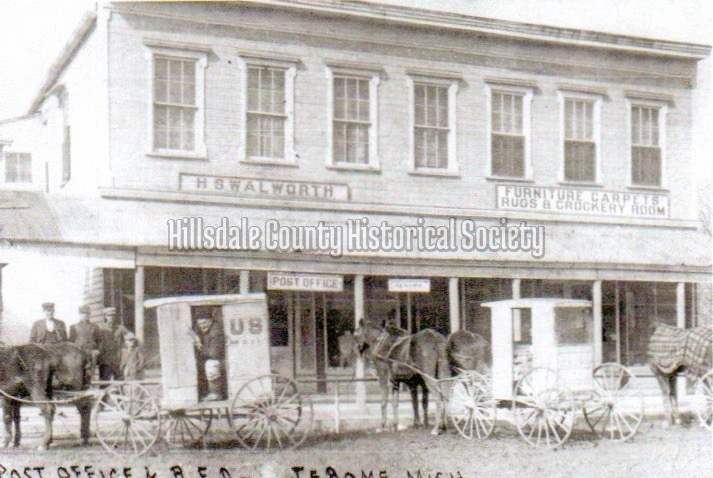 The Jerome Post Office and Rural Free Delivery mail wagons, c. 1913 (left). The rest of the building housed the H.S. Walworth store, which offered furniture, carpet, rugs and crockery. The Jerome Creamery Company (right) started business in 1899 and was able to pay a 10% dividend by the end of their second year. Distribution of their product by train was important to their success. The East Michigan Asylum in Pontiac was a regular customer in 1900.